Processing: Images were captured with Artemis Capture (as FITs). Aligned/stacked and dark subtracted in Astroart with Sigma Combine. IR / UV Blocking filter and Color channels were scaled and color balanced in Astroart. Channels were co-registered in Astroart. Luminance construction consisted of the IR/UV blocking filter exposures. Curves and Levels applied in Photoshop to the Luminance construction to optimize object features. A light background noise reduction was applied to the luminance construction in Photoshop. Final LRGB combine was done in Photoshop using Luminance Layering. Final Image size is approximately 1092 x 1044. All exposures in this image were guided; North is up in this image. This object is named by the author as the "Blue Dog". 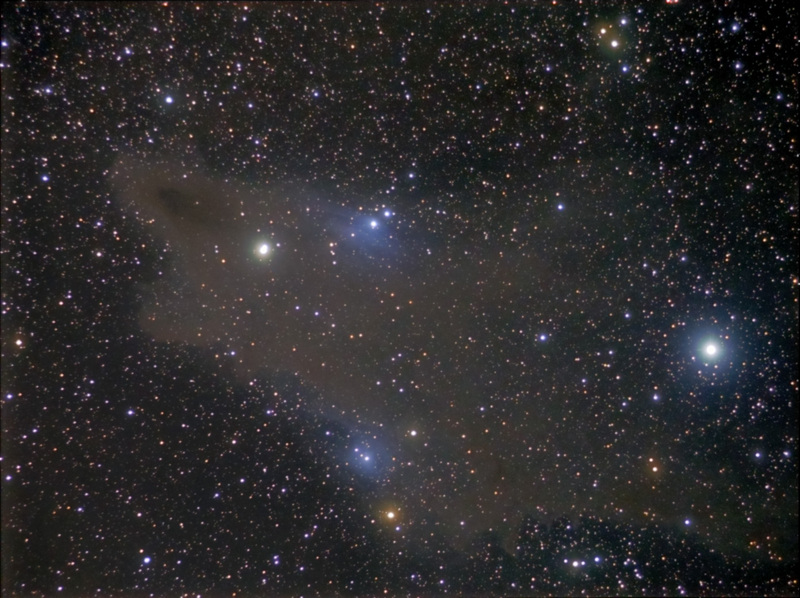 I have not found a catalog reference for this region of dust and reflection nebula in the constellation of Cepheus. The stars seemingly illuminating the reflection nebulae are approximately 1000 light years distant from Earth. One may speculate from that fact that the dust structure is approximately the same distance. The star representing the Dog's eye (HD211300) is in the foreground at about 880 light years distant. The Horizontal FOV is 101'. Image center is located approximately - Equatorial 2000: RA: 22h 08m 52s Dec: +73°14'34"